[AUTO](RC) Generation Break 1 (This ability is active if you have one or more face up G units in total on your (VC) or G zone):[Counter Blast (1)] When this unit attacks a vanguard, if this unit is boosted, you may pay the cost. If you do, choose one of your opponent's rear-guards, [Rest] it, and until end of your opponent's next turn, it get "[AUTO](RC):At the end of your turn, if this unit is [Rest], your opponent may draw a card. 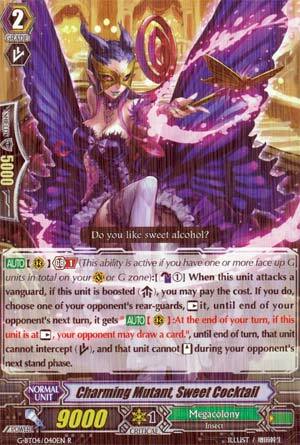 ", that unit cannot intercept until end of turn, and that unit cannot [Stand] during your opponent's next stand phase. Sweet Cocktail, the GB1 on-attack when boosted unit. Well, when that happens, for CB1 it chooses a rear-guard, stuns it AND prevents it from intercepting for the whole turn, and at the opponent's end phase if it's still on the board and it's rested, you can draw a card. Basically, it's a pretty neat way to force the opponent to expend shield they don't want to by sealing intercepts and drawing as a bonus. Again, for G Megacolony it's basically only really good there due to Machining's RG restraints, but it does what it does well enough. Not especially interesting to talk about but still good anyway. So the GBCBX of Megacolony gets to stun a rear guard and if it's a Grade 2, it can't intercept and it can't restand, but, in exchange, the controller of the card gets to draw a card at the end of your turn. Seems pretty decent at least. Repeatable, but I think there are better Megacolony units that stun. Today's card is MC's Amber Clone, Sweet Cocktail. When it attacks while boosted at GB1, pay CB1 to rest, stun, prevent intercept, and do what the name calls "gigaparalyze" which is the effect in the red text. One thing you might notice is that this prevents intercepting, while Darkface doesn't. Logically you should use this on frontrow RGs and Darkface on backrows. It's obviously a good effect, I like how MC punishes the opponent for not retiring over an RG, making these gigaparalyze skills win-win except against certain matchups like SP or BT. Not much else to say. Good card, run in any MC build not called Machinings.